The VIII Constitutional Government today, December 6, 2018, presented the General State Budget (OGE) for fiscal year 2019 in the National Parliament. 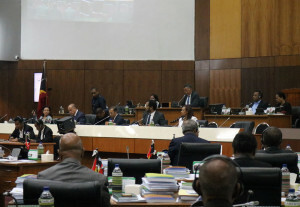 Prime Minister Taur Matan Ruak expressed great satisfaction to be able to present the budget "after overcoming the various obstacles, difficulties and understandable delays, economic constraints and reduced preparation time", "the first budget, which aims at realizing the vision of Timor-Leste, by 2030, in a Rich, Strong and Secure Country, a more prosperous, modern and developed Country". Taur Matan Ruak said that OGE 2019 will contribute to the economic and social growth of the country, as that the approval of this budget "marks the end of a period of uncertainty with renewed hope and confidence in the beginning of a new cycle of political, economic and financial stability, "with a" forecast of 5.9% annual growth accompanied by improved living conditions, with the resumption of household consumption "and the boost to private investment, through "the implementation of large projects implemented by Public-Private Partnerships". The OGE for 2019 has a total amount of $ 1,827 million to cover expenditures of all state agencies, departments and institutions, $ 87 million for loan-financed projects and $ 162.6 million for Development Partners. The Prime Minister also noted that the four pillars defined by the National Strategic Development Plan (NSDP 2011-2030), which were also incorporated into the five major development priorities of the VIII Constitutional Government, namely: development of infrastructures, development of social capital, development of the economy, government consolidation and anti-corruption". The proposal was sent by the Government to the National Parliament on November 8 and will be debated in general on December 6, 10 and 11, 2018. The discussion and voting in the specialty are expected to begin on the 12th December and continue until the 22nd of December 2018. After a thorough examination of all the articles of the proposal, there will be a final overall vote on the text of the proposed bill with the approved amendments, which will be later sent to the President of the Republic for promulgation.